A Virus Named TOM has got itself a fancy new trailer. The four player cooperative puzzle game launches next week, offering a welcome oasis in the summer gaming drought. AVNT in more than a simple circuit puzzle game.. It features 50 single player levels and 50 co-op levels, plus a Battle mode and unlockable upgrades. Check out the video and you'll see it all play out in a lovely grid of circuitous chaos. Oh, and mind the wub. It's infectious. 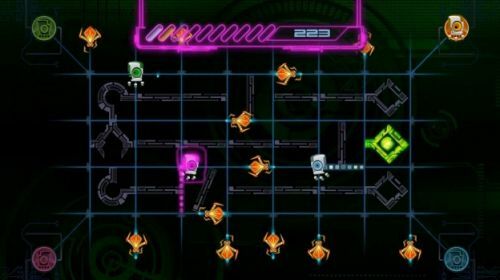 A Virus Named TOM supports four player local co-op. It will be available for PC download on Steam and Desura for $9.99 on August 1st. You can preorder from the game's home page and get a 50% discount along with access to the beta and a Steam key. That's five bucks, for those of you who are done doing math for the day. This should be a nice warm-up for the coming fall release schedule. Page created in 0.2434 seconds.